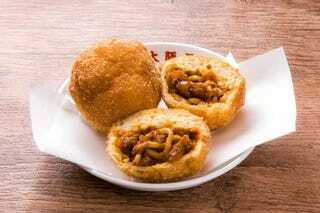 From the country that gave the world ramen burgers, we have this: "ramen donuts" (ラーメンドーナツ). They're ramen noodles but inside donuts. Clever, no? Sankei News and Macaroni report that restaurant chain Osaka Ohsho is rolling out the special dish for a very limited time only. The ramen donut even came in first place among one hundred entries at an employee food contest for the restaurant chain. The ramen donut is made with fried bread, so don't think of this like a sweet, glazed donut. It's more spicy! Inside the donut, of course, there are thick ramen noodles in a savory sauce. Looks interesting! Looks good! I'm keen. LET'S DO THIS. The ramen donuts will be available at Osaka Ohsho until September 30 for 210 yen (around US$2) a pop.